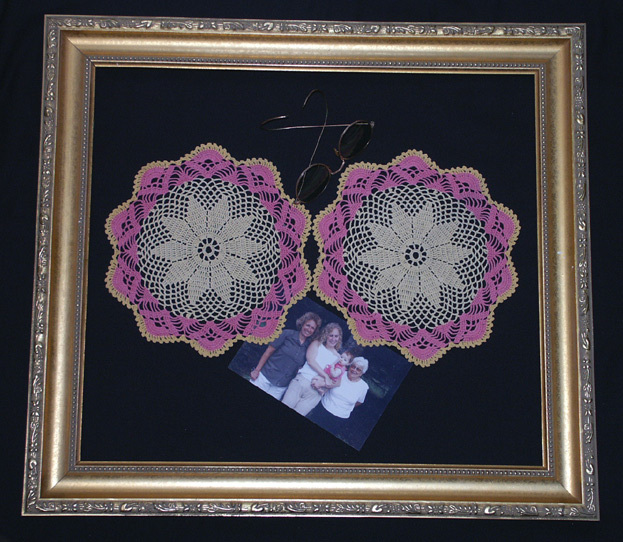 Grandma's handmade lace doilies were definitely symmetrical. Having two completed the balance. The photo with great grandma wearing the glasses completes the story. Shot against a black background to bring out the color and symmetry of the work. Was cropped to fit size requirements and brightness was slightly adjusted. Would have preferred a close up of the doilies, without the photo, to emphasize the pattern of the doilies. The frame seems to be crooked within the cropped "frame" of the photo, and looks kind of odd to me. Curious image. It appears to be hanging on a wall except for the sunglasses. I wonder what you were thinking when constructing this image. Looks like four generations there in the photo. What a great keep sake. Nice. The snapshop took away from the nice symmetry pattern. sorry. Proudly hosted by Sargasso Networks. Current Server Time: 04/26/2019 09:39:08 AM EDT.